What would you do if you became convinced that your marriage was one of your best opportunities to honor and obey Jesus Christ? How would you respond if you realized that wherever two or three believers are gathered in His name, Jesus is among you? Are you clear on what He wants you to do? The following suggestions come from my professional training, in which I learned what makes small groups of people successful in both relationships and the group’s purpose. It is very important to agree on a biblically significant purpose for your marriage. A marriage without a purpose (beyond your own pleasure or security) is like a ship without a rudder or a destination. Many of the things that get in the way of a successful Christian marriage can be eliminated by focusing on the biblical purpose, recognizing that together as husband and wife you are a key part of Jesus’ church. Your purpose should describe a result, not merely an activity. “To be each other’s helper” is not specific enough. It is also important to include the phrase “to help one another” in your purpose statement (“Adam needed a helper.” — Genesis 2:18). My suggestion is that you adopt something like the following for a marriage purpose: The purpose of our marriage is to glorify God by helping each other enjoy God and be all that He wants each of us to be, as well as to work together to be all that God wants us to be together as a component of His church. Discuss with your spouse the costs such a marriage will entail, considering your newly adopted purpose. Things to consider may include but are not limited to the following: (a) commitment to help each other; (b) letting Jesus lead, (c) confidentiality; (d) learning the Togethers of Scripture and letting these instructions from God guide your marital behavior, (e) avoiding win‒lose outcomes, (f) being out for the other’s success more than your own (Philippians 2:3). Agree with each other to pursue the purpose and do whatever is needed to work toward fulfilling your purpose. Brainstorm more specific things that might be required in your marriage to accomplish the purpose (relationship problems that must be overcome, no matter what the cost or course of action necessary, finding time alone free from interruption, a consistent date night, etc.). Remember that your stated purpose should shape this discussion. This a good time to look over the list of 65 Togethers of Scripture, because these are the specific things that need to be done together as wife and husband to glorify God. Brainstorm the many things that could prevent your marriage from being what God wants it to be (mean behavior, not sharing chores, not making time available to be with each other, etc.). Perhaps it would be good to discuss what it means for a marriage to be a part of the kingdom of God. 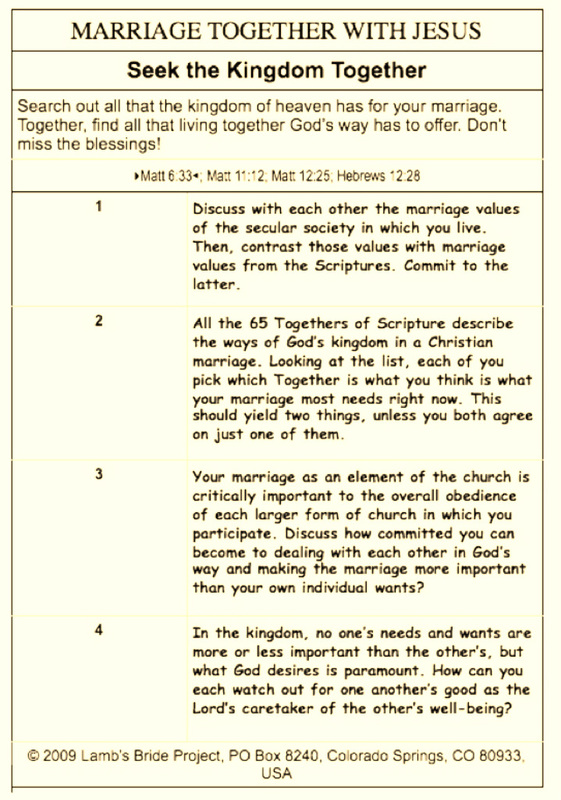 Here are the suggested actions from the “Marriage Together with Jesus” card included in the 65-card deck available.